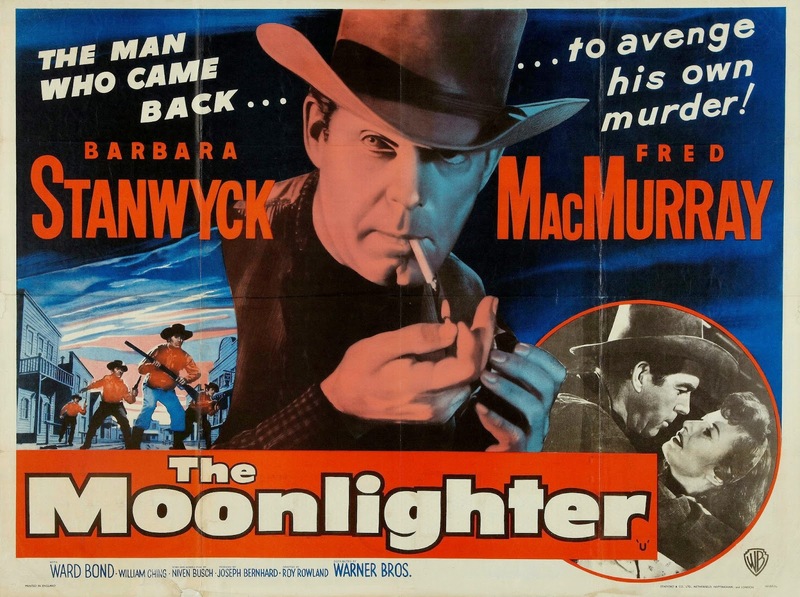 This week's Western is The Moonlighter (1953) starring frequent screen team Fred MacMurray and Barbara Stanwyck. Legendary old Hollywood stars Fred MacMurray and Barbara Stanwyck teamed up in four movies, including the classic film noir, Double Indemnity (1944), the Douglas Sirk domestic drama, There's Always Tomorrow and the romantic comedy, Remember the Night (1940). The Moonlighter is probably MacMurray and Stanwyck's weakest onscreen outing. 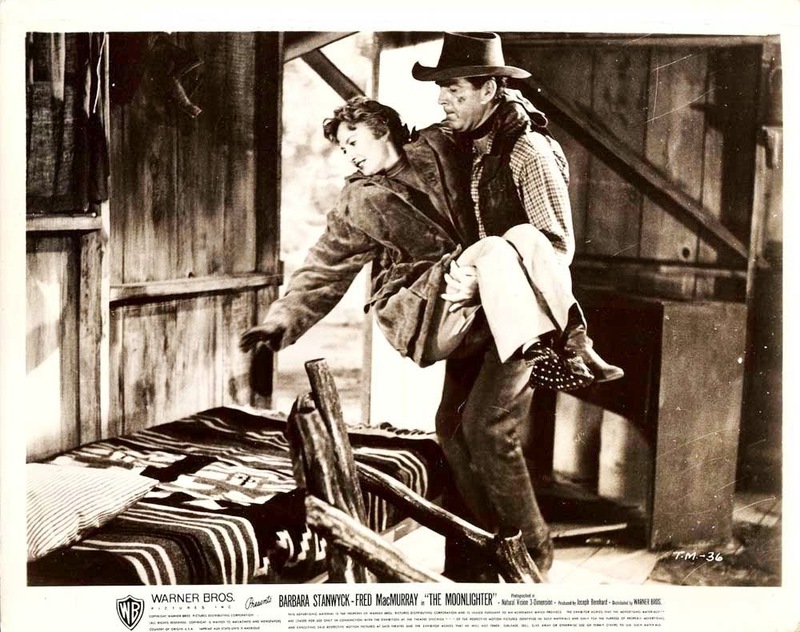 The film, directed by the reliable Roy Rowland, is really just a glorified B Western gussied up with A-list stars and the 3-D photography that was all the rage in the early fifties. Nevertheless, it is an enjoyable film with some beautiful High Sierras scenery and plenty of chemistry between the two leads. Fred MacMurray gets Barbara Stanwyck out of the drink in The Moonlighter (1953). The Moonlighter begins with Wes Anderson (MacMurray) sitting in the county jail waiting for "a necktie party" while a bloodthirsty lynch mob riots outside. The crowd wants to hang Anderson's thieving hide for cattle rustling (his special talent is stealing cattle at night thus "the moonlighter" nickname). Anderson escapes at the last minute -- another man is mistakenly hanged in his place -- so he returns to his hometown and his old flame, Rela (Stanwyck), who by now has taken up with Anderson's brother, Tom (William Ching). The rest of the film meanders along without really settling on a definable plot. The Moonlighter even manages to waste the inestimable Ward Bond, a character actor who enlivened many a horse opera. There's some humor (MacMurray preaches his own funeral while forcing attendees to make "generous" donations at gunpoint), some romance and a fantastic action sequence filmed at the Peppermist Falls in the High Sierras. A vintage poster for The Moonlighter (1950). The real revelation in The Moonlighter is Stanwyck. Rela isn't a delicate flower in hoop skirts waiting for her man to save the day. Instead, she is a woman of action who wears pants and knows how to use a Winchester. Stanwyck probably made more Westerns than any major female star in old Hollywood. The Western allowed women more freedom of expression than other genres -- see Doris Day in Calamity Jane (1953) and Joan Crawford in Johnny Guitar (1954) --which fit in perfectly with Stanwyck's tough cookie persona. Rowland remembered Stanwyck's insistence on performing her own stunts, including sliding down the rocky face of the Peppermist Falls while hitting her back, stomach and legs. "She was capable of doing her own stunt work and completely unafraid," Rowland said, according to the American Film Institute notes. "She never held up the picture in any way." 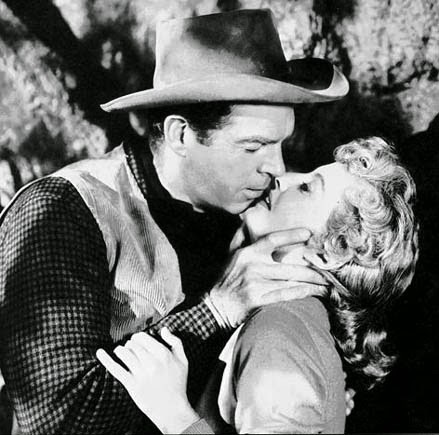 Fred MacMurray and Barbara Stanwyck in the Moonlighter (1953). Stanwyck appeared in many Westerns in the fifties, including The Furies (1950), The Cattle Queen of Montana (1954) and Forty Guns (1957). We'll have much more about those films as we continue our Top 100 Westerns series. Go here, for more of our Top 100 Westerns. Next week, we'll feature Rodgers and Hammerstein's Oklahoma.